There is probably nothing more American than I can think of than Apple Pie, baseball, and pond fishing for Largemouth Bass! 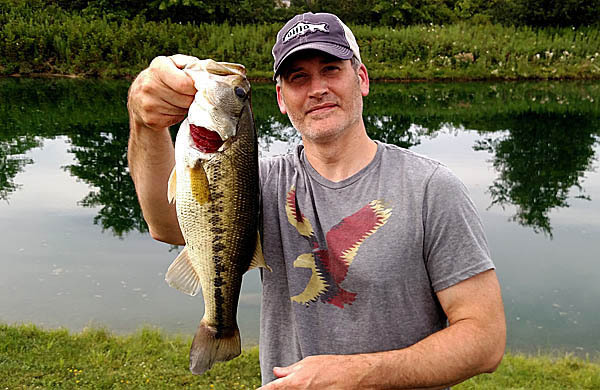 Most of the fish I catch in ponds are smaller or less than average sized. Every now and then though, a big grand-daddy pig amongst guppies comes along and gives a great memory, such as the fish below. As for the title of this blog entry… I started an Instagram account and have began posting some of my fishing photos to it. I noticed that the “Official Bill Dance” liked a variation of the above picture. So if this bass is good enough to get a ‘like’ from Bill Dance, it’s plenty of validation to me it’s a nice fish. Thanks, Bill!, I feel almost fishing famous!